We present a fully functional material extrusion printer for optically transparent glass. The printer is comprised of scalable modular elements, able to operate at the high temperatures required to process glass from a molten state to an annealed product. We demonstrate a process enabling the construction of 3D parts as described by Computer Aided Design (CAD) models. Processing parameters such as temperature, which control glass viscosity, and flow rate, layer height and feed rate, can thus be adjusted to tailor printing to the desired component, its shape and its properties. 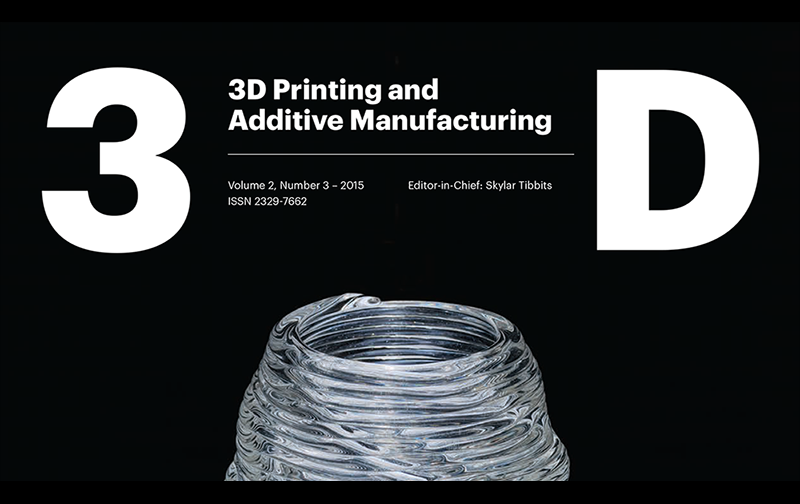 We explored, defined and hard‐coded geometric constraints and coiling patterns as well as the integration of various colors into the current controllable process, contributing to a new design and manufacturing space. We report on performed characterization of the printed material executed to determine their morphological, mechanical and optical properties. Printed parts demonstrated strong adhesion between layers and satisfying optical clarity. Demonstration of this molten glass 3D printer and fabricated objects demonstrates the production of parts, which are highly repeatable, enable light transmission, and resemble the visual and mechanical performance of glass constructs that are conventionally obtained. Utilizing the optical nature of glass, complex caustic patterns were created by projecting light through the printed objects. The 3D printed glass objects described here can thus be extended to implementations across scales and functional domains including product and architectural design. This research lies at the intersection of design, engineering, science and art, representing a highly interdisciplinary approach. Link to paper here.